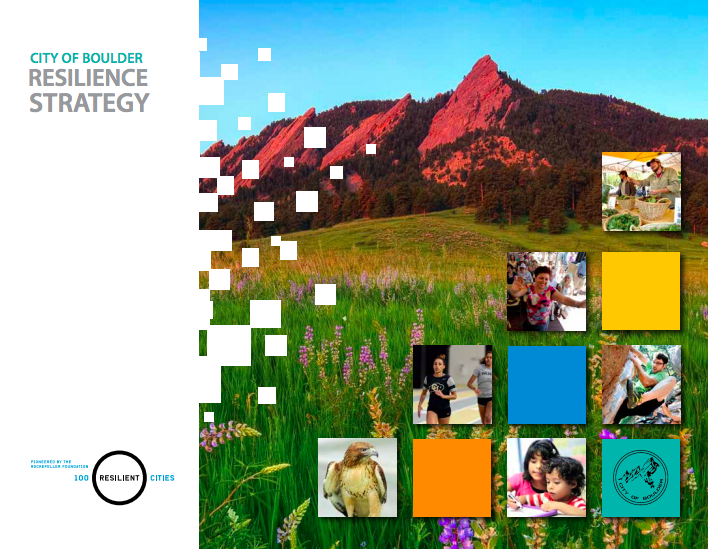 Boulder has a long history of planning today for the challenges of tomorrow, creating innovative solutions, and undertaking successful resilience-building activities and projects. From its 40+ year legacy of open space preservation, to pioneering commitments to climate action goals, the community has supported some of the most progressive resilience activities in the country for decades, even before we saw them as building Boulder’s resilience. In order to mobilize the resources and community support necessary to significantly increase social, economic and ecological resilience, we must have a compelling vision of the future that allows us to adapt and thrive in the face of disruption. Tapping into the community’s forward-thinking civic and planning culture, the goal is to weave resilience into the day-to-day life and functions of community and government. This strategy knits those activities together and presents new actions to address gaps and weaknesses discovered through a community-wide assessment to create an integrated, strategic, and intentional approach to building resilience. The actions included here are immediately implementable activities that take advantage of partnerships and resources offered by the 100 Resilient Cities network. They build off of a long and fruitful legacy in Boulder’s community and intend to bring new resources and perspectives to existing ones.